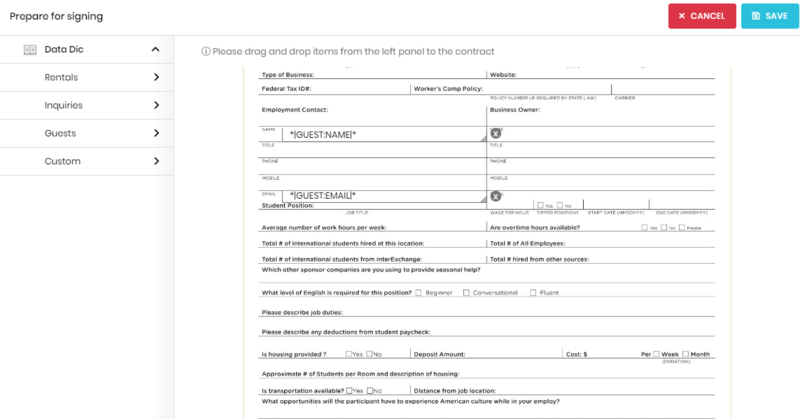 Creating an automatically-filled, printable template is easy with Signature. With an intuitive drag-and-drop interface, with powerful customization option, preparing your templates has never been easier! The document editor uses a combination of drag-and-drop data fields, and customizable labels to allow you to easily place and identify the different data fields in your template. Click on a data field from the menu on the left, and drag it into the editor window. You can drag and resize each field to position it perfectly within your template. Insert a data code from your Tokeet account by adding data dictionary fields. Click the Data Dictionary button to view the full list of selectable data codes, so that you can click and drag the data code you wish to insert.